Amazon – India’s One of the biggest online mega-store. Shop at Huge discounts on this Special Occasion of Diwali and make your day special. Amazon is giving Huge Discounts / Cashback and Additional Offers on each and every purchases made during this period. Here is a Small introduction regarding this offer. As we all know Amazon is now providing Email Gift Vouchers of popular brands like – Cleartrip, Lakme, Levis, Makemytrip, Shoppers Stop, Westwide, Pantaloons, PVR Cinema’s, Arvind. But Amazon is now giving Flat Rs.200 off on the all gift cards. 2. Browse through the all the Special Gift Vouchers. 3. 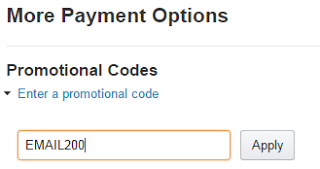 Enter amount you want to Buy i.e. Rs.1,000 or any other. 4. Then add the Product into you cart and proceed further. 6. You will get flat Rs.200 Discount. 7. Now just pay the required amount through Online Banking. 8. Gift Voucher will be mailed to the Recipient. > Get Rs.200 off on purchase of Gift Cards worth Rs.1000 or more from the below Brands. > Offer is valid till 31st May 2016. > Coupon code EMAIL200 has to be used to avail this offer. > The offer is also valid on the 16 third party gift card brands given below. > Offer valid only on Email Gift Vouchers purchases. > Valid Once per user only. > This offer is not valid on gift cards from other brands or sellers. Uncategorized discount offers, Free Amazon Gift Cards, Free Amazon Gift Cards & PayPal Cash, free gift cards. permalink.